Non-Stick Ceramic Coating SLX Version 2.0 is coated inside and out with our proprietary non-stick ceramic. Every lip, every tooth – even the pollen chamber. It never sticks, and it doesn’t need cleaning. Our coating is bonded with the aluminum at the molecular level, ensuring durability, is 100% non-toxic, FDA approved, and will not burn or release any harmful chemicals. ZERO Teflon® or PTFE Teflon® (PTFE) fumes are so toxic when inhaled that Dupont® had to ban its use in the tobacco industry. Even if we could use PTFE, we wouldn’t – PTFE coatings are plastic based and not durable enough for serious use. 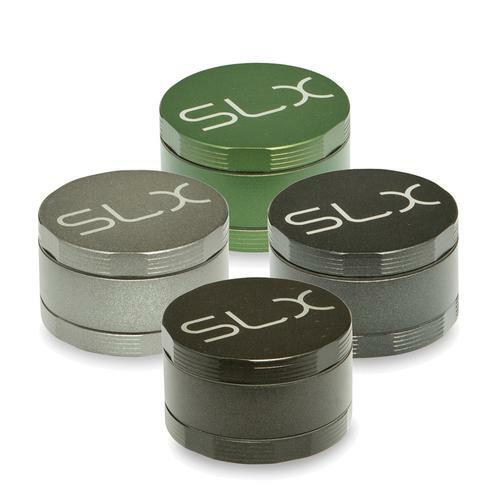 You deserve the best when you buy a SLX herb grinder, and Teflon® doesn’t cut it. Aerospace-Grade Aluminum Machined out of 7075 T6 aluminum to prevent cross-threading, bent and broken teeth, or other damage. Most grinders are made from weaker 6 series aluminum. 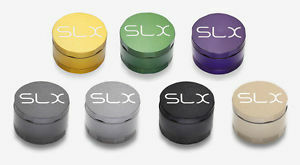 7 series is more expensive to machine, but it ensures your SLX herb grinder will last a lifetime. Premium Screens SLX herb grinders feature drum tight stainless steel screens with a fine micron size – ensuring only pollen gets filtered, not pieces of herb. Perfect for pressing. And they lift out without threads! Rare Earth Magnets Neodymium magnets ensure your SLX doesn’t pop open unexpectedly; keeping your herbs, moisture, and scent safely inside. 2 Sizes Available in both 2 inch (50.8mm) pocket-size and 2.5 inch (62mm) home-size. But both are 20% shorter than standard models due to our unique screen stage, so either size is easy to slip into your pocket or purse. Just 1 Set of Threads Our screen stage slips out without threads – so your pollen isn’t upended every time you empty your ground herbs. The SLX Promise We put our URL on the bottom of every grinder for a reason. If you’re ever dissatisfied for any reason, contact us and we’ll make it right.